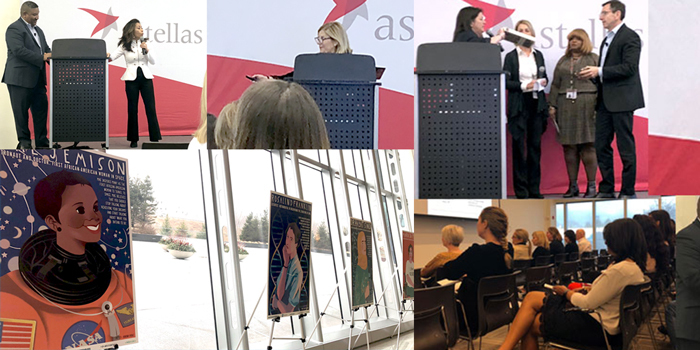 In honor of Women’s History Month and International Women’s Day, Astellas recently held its second Stellar Women Summit. Sponsored by Astellas’ Stellar Women Employee Resource Group, the Summit featured remarks from Stellar Women members and leadership who discussed Astellas’ efforts to advocate for gender parity and empowerment of women in the workplace. In addition to Linda, this year’s sessions included Keya Pitts, executive director, Quality Assurance and Walt Johnson, senior vice president, Urology Hospital Business Unit talking about the Stellar Girls STEM program; Rod Christmon, executive director, Human Resources and Eloiza Domingo-Snyder, executive director, Diversity & Inclusion, discussing how Astellas employees can continue to drive inclusion; and Bill Fitzsimmons, vice president Regulatory Affairs who reflected on his four-year tenure as Stellar Women ERG executive sponsor. Astellas’ commitment to changing tomorrow includes building and maintaining a culture of diversity & inclusion, and the Stellar Women ERG is a key component of that work. Astellas in the Americas has been recognized as an employer of choice by Forbes and Working Mother magazines, as well as a Great Place to Work in the Pharma Industry, and on the Human Rights Campaign’s Corporate Equality Index.